An exceptionally rare and important early 1850s initial model antique Cammann binaural stethoscope. Tiemann / N[ew]. YORK is stamped on the obverse of the yoke. This mark indicates a pre-1855 Tiemann date. The reverse is delicately hand-engraved: Dr. Cammann's / Stethoscope. 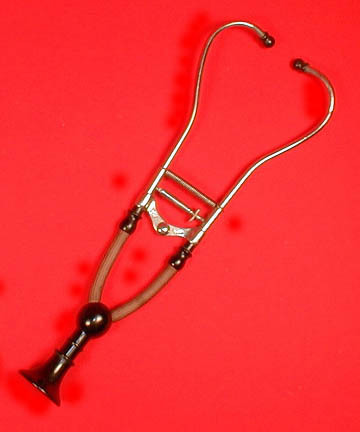 Note the relatively short tubes, when compared to later Cammann's stethoscopes, and the velvet sleeves. The large and flaring chestpiece was turned from ebony wood, and the earpieces are ivory. 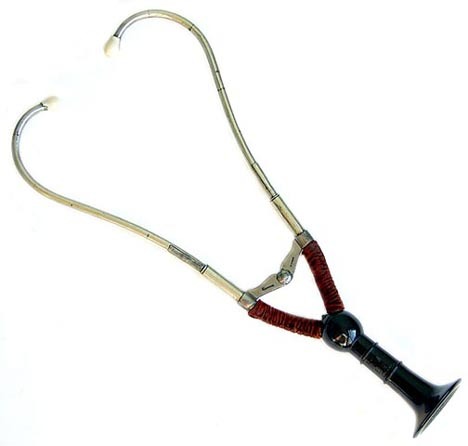 This the first commercially available binaural stethoscope, and it was invented by George Cammann, of New York City, in 1852. George Tiemann, also of New York City, is believed to have been the manufacturer that Cammann sought-out to make the instrument. To my knowledge, only three other examples of the prime Cammann stethoscope are recorded. They are at the Wellcome Medical Museum, London, at the National Museum of Health and Medicine of the Armed Forces Institute of Pathology, Walter Reed Army Medical Center, Bethesda, and one in a private collection. This is the very instrument pictured in Edmonson, p. 106, figs. 138 and 139. 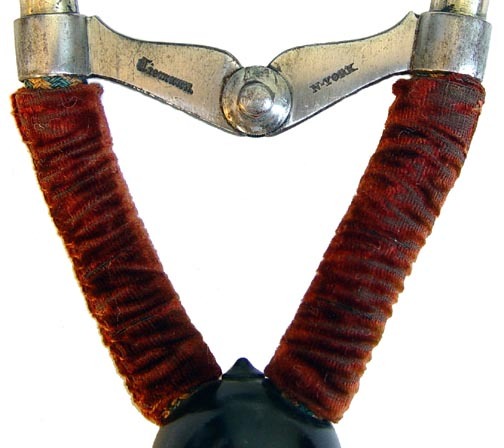 The c. 1880 Cammann stethoscope shown below is a later model and the bridge is twice marked: WOCHER & SON. Max Wocher is a well-known Cincinnati firm. For additional stethoscopes and other medical antiques, visit the various sections of this web site.